Preheat oven at 180°C. Peel the red onions and cut into wedges. Toss in equal quantities of balsamic and olive oil. Season in salt and pepper and roast for 10 minutes, stirring at the 5 minute mark. Set aside to cool in the juices. Peel the oranges evenly and cut the segments out; set aside. Bend one asparagus spear until it snaps. This will tell you where to cut the rest of the bunch. Discard the woody end and toss the spears in olive oil, salt and pepper. Take the fresh peas out of their pods and blanch in hot water for 30 seconds then refresh in cold running water and set aside. Make a dressing with the almond paste and about ¼ cup of olive oil, salt and pepper. Whisk until emulsified. Toss the prawns in olive oil, salt and pepper and grill for 1 minute on each side. 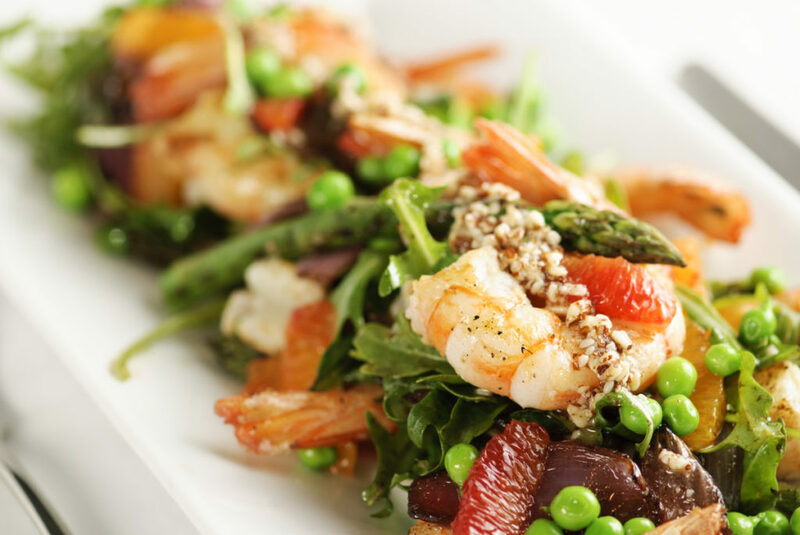 Place the cooked prawns, grilled asparagus, peas, roasted onions and rocket in a bowl and dress with the almond dressing. Serve on a platter and garnish with peeled orange segments.